The DCI Fan Network delivered fans post-show OnDemand Playback from Stanford, Calif. and Kalamazoo, Mich., both on July 5. Now, an unscheduled addition to the Fan Network's constantly growing archive of performances is the third and final show that took place on July 5, "Music in Motion" from Clifton, N.J. The four world class performances from that event, featuring The Cadets, Carolina Crown, Boston Crusaders, and Crossmen, mean that all 18 of the 20 World Class corps performing on July 5 can now be seen in their entirety through the Fan Network. 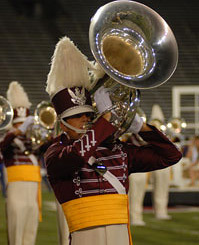 Another addition to the Fan Network's OnDemand replays will be the second "Music in Motion" show of the DCI Summer Tour in West Chester, Pa. That contest scheduled for July 31 will feature the Jersey Surf in Open Class, as well as the World Class Crossmen, Glassmen, Blue Knights, Carolina Crown, Blue Devils, and Cadets. Fan Network subscribers: Check out the Clifton, N.J. OnDemand Playback now! Also coming up soon on the Fan Network will be the exclusive Live Webcast from this Saturday's Drums Along the Rockies Premier Event in Denver, Colo. Featuring a high-powered lineup of eight World Class corps, this will be the first heated matchup of the season between the two currently undefeated corps, the Blue Devils and the Cavaliers. Learn more about the Drums Along the Rockies Live Webcast. With every Live Webcast and all OnDemand video included in a subscription, the Fan Network is the next best thing to being in the stands! For the low subscription price of $69, you can get complete access to performances from this summer, exclusive World Class corps content, and unlimited audio and video from the Drum Corps International media archives back to 1972! Subscribe to the Fan Network today.